What do you guys think. 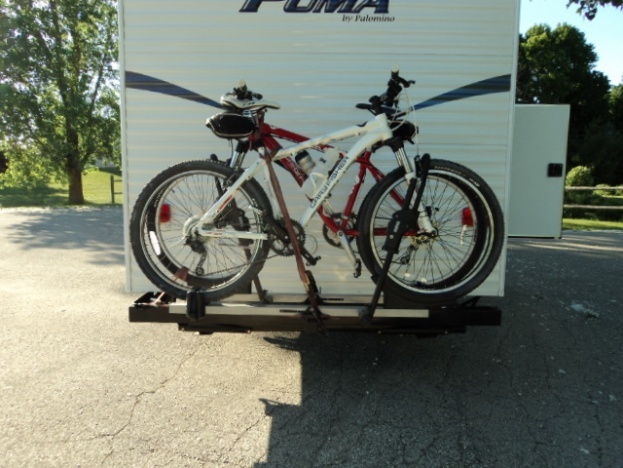 I heard alot of horror stories with bike racks on the back of campers. Two of my cousins had their bumpers start ripping at the welds, and one was bouncing his bikes off the back of his camper. Put a good dent in the aluminum siding. But they were all the bike rack mounts that clamp to the bumper which torques on the bumper. So I welded a receiver from a floor joist to the bumper and also welded angles on each side where the bumper mounts to the frame. Should keep the bumper from twisting off. Would have to shear straight off now. Had the wife follow me to see if the bikes bounce around and said they didn't move at all. Yeah, I see that a lot, and was thinking about doing the same. The problem is that the bikes still bounce back there - try going over a bump and have the wife watch it from behind. 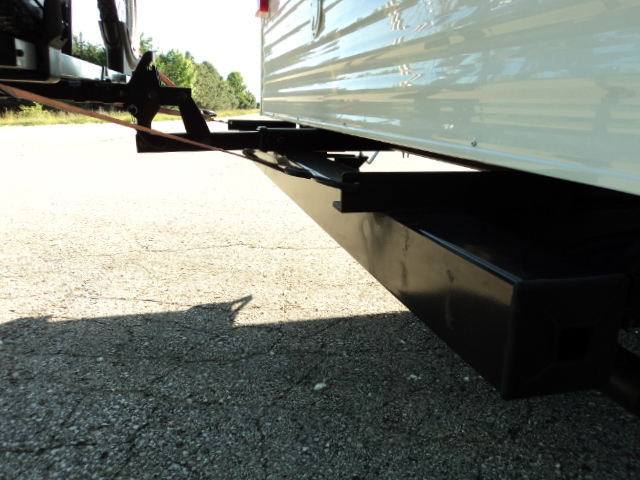 The bumping is caused by the lack of a real suspension under the trailer. That is the reason that so many of these mounts fail, especially when attached to the bumper. Even if there is no visible bumping - that could be even worse, as that means you welded everything so tight that there is no play. The force is still there though, just not visible. In your case, there is still the chance of the rack itself failing, I would recommend you keep on checking the welds on a regular basis. I also called my trailer manufacturer and the trailer frame manufacturer. Both recommended against mounting a hitch / bike holder to the frame, and both told me that it would void at least parts of the warranty. I have also read a report of a guy having cracks in seams (trailer walls), and the manufacturer blamed the frame twisting under the trailer caused by the bike mount and the weight back there. Sounds kind of like a lame excuse, but it sure didn't help the guy. I stayed away in the end, and mounted 4 bikes above the truck bed. Even though I would have loved doing it your way, because it kind of seems like an ideal spot back there to balance out some of the 130 lbs that I have right on the tongue from my dual 6V battery setup. Last edited by flixden; 06-15-2012 at 09:25 PM. My brother welded a similar setup on his 5er - no problems. I made a angle aluminum frame and have a box clamped to my bumper for the leveling blocks and wheel chocks. So far, so good after 5 years. Flixden, I have a rack built for the box too. but I keep the dog back their when traveling. Truck has a cap on it. And with the truck cap, family in the truck, and the hitch weight of the tt I'm within a hundred pounds of my trucks legal limit. So the bikes kinda of help balance things out when in back. Been to the scales at least six times making sure the weights are good. and the trailer pulls great. So hopfefully the rack holds up. I was going to reinforce it by welding a 1/4" c-channel across the length of the bumper but ran out of time before the last camping trip. So I might end up doing this yet. Mbop, thats good to hear. I think it will be fine as most of the roads we travel are pretty smooth. I think you'll be fine. All I would do if I were you is keep on inspecting the welds and the rack every now and then. I know where you are coming from with the payload limit. The bikes back there will help reduce the tongue weight a little. i built my neighbor a rack on the back of his 5r that holds a honda 3000i generator. he's got ~20 trips on it no problems. i took the whole back bumper off (holds the poop pipe) and welded on a 4" square 1/8" hollow steel stock back in it's place. welded in extra gussets and flat bar and then made a mesh style ramp/box and voila. 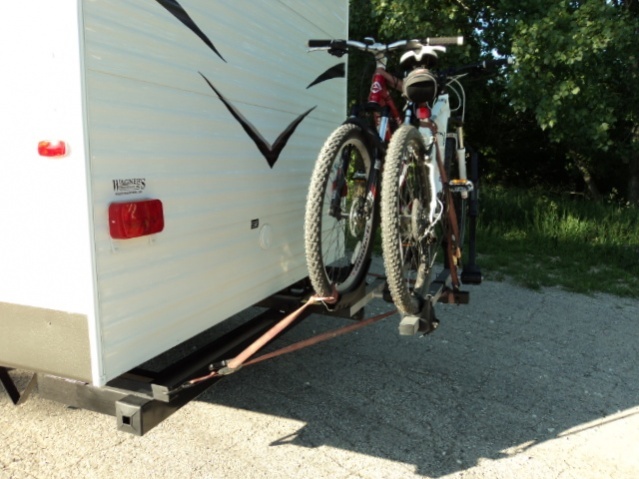 Quick Reply: My tt bumper mount bike rack.